Jul 6 11 Times The Spice Girls Outfits Looked Kinda Awful (But We Loved It Anyway). Okay, so it was the '90s and The Spice Girls were at the height of their fame - and the epitome of covetable style for pre teens. But now? Less so. Their debut single Wannabe hit the UK charts 20 years ago today - and while their songs still hold a very special place in our hearts - right next to Polly Pockets and butterfly clips - in retrospect there's some outfits that really called for a stylist being sacked (except for any that involved Baby in knee high platforms - I'll take a pair in every colour thanks). #1 - 100% peak Spice. 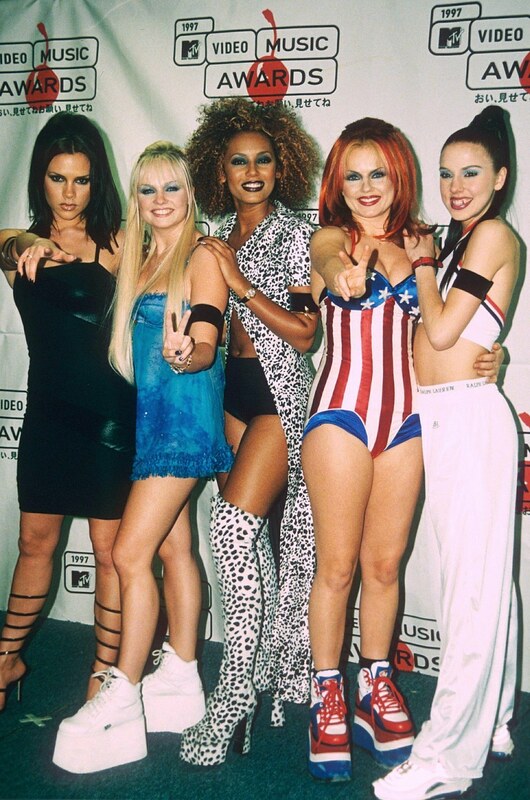 Victoria's pose, Geri's odd USA-centric patriotism, Mel C's high-waisted track pants. #3 - When they met Prince Charles and Geri wore a tasseled holographic leotard - and Mel C wore a tracksuit. Obvs. #4 - That time Mel B had mad hair horns. #5 - When Emma realised every '90s girls' dream of wearing that Fiorucci cherub to an actual photo shoot. #6 - Just all these stage looks. #7 - That time velvet, sequins and a leopard bra all made it into the same photo (points for the matching boots though). #8 - This take on smart casual. #10 - When 'body glitter and gems' was the aesthetic (and Geri wasn't invited). #11 - And when Pepsi was a better aesthetic. #11 - So. Much. Pleather. Never change, ladies, never change.